Los Angeles. Explore. Discover. Learn. Share. Hundreds of hours dedicated to training and millions of steps led thousands of people from all walks of life – to accomplish a goal they set forth for themselves on March 18th 2012. 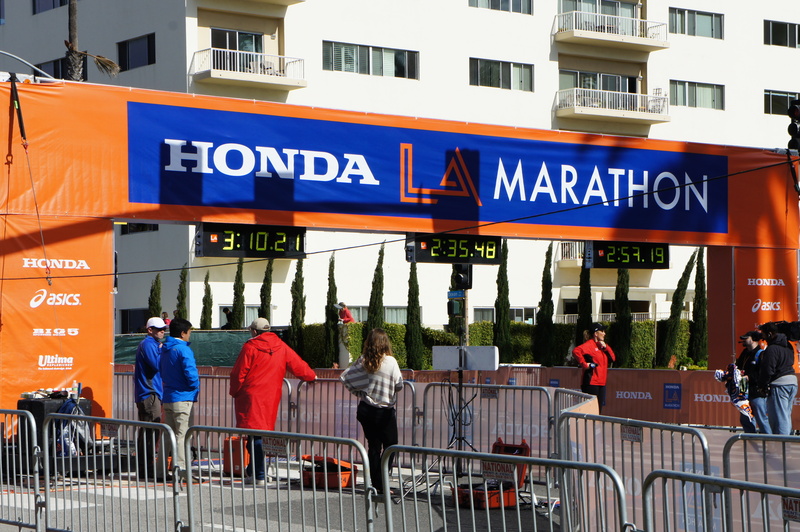 The Los Angeles Marathon is a celebratory day for the city every year. When traffic frustration or population concerns overwhelm – cheering for the possibilities of the human spirit never gets old. Having participated in three LA Marathons, from 1996 – 98, I learned why we’re all naturally connected to each other. Training for something so grueling can deplete your emotional and physical gas tank many times over. The hours can be lonely and the training routes can be desolate. Running is said to be one of the best exercises, but it is also one of the most demanding and there is no substitute. In order to be a runner— you gotta run. We cheer for that struggle because we all identify with the road you must travel to accomplish any goal. Today, rain was predicted but the marathon Gods overruled. Cool weather — ideal for a 26.2 mile trip on the streets of Los Angeles. The course is always lined with support and makes its way through a motley crew of LA neighborhoods. The race wouldn’t be possible without volunteers – but more importantly, Angelenos. The same Angelenos, who may honk at you to speed up tomorrow, deny your request to merge into their car lane or, refuse to lower the volume on their cell phone conversation. We all tend to put ourselves first in the race of life. Once a year though, in early spring – we love and support each other and the best part of that is – we aren’t afraid to show it. A round of applause for the human spirit. I feel like I was there. I felt the exact same way when I was able to watch the NYC marathon finish. It’s exuberance, plain and simple. Love it!! A few of my favorites..